After watching its first episode, I thought I should be pretty sure about what the series is about, a teenage boy riding space Gundam’s fighting against alien species that annihilated all but a spaceship’s full of people in some post-apocalypse world. How could I be wrong? It has got a poster with protagonist Nagate Tanikaze (谷風 長道) standing on the imposing Gardes (衛人) as his ride. It has got battlefield anthems as OPs with lines like “for whom/what reason I fight”, and at the end of the day, it’s called “Knights of Sidonia”, knight as riders of machine but more, in my opinion, as a class of nobility. It’s not called “Worriers of Sidonia” or “Mercenaries of Sidonia” or “Mobile Suit Gardes” for a reason, that alongside battles against alien species, we should be expecting maybe some philosophical reflections of the battles, about why mankind came to such apocalypse in the first place, about the lessons and implications that could be passed down to future generations once this Noah’s Ark in space has found a suitable planet as mankind’s habitat, something that a knight, noble of state would think about but mercenaries would not, something that would correspond to the lines in OP. Unfortunately, there isn’t. On the contrary, I uncomfortably found great bulk of the series to evolve around how different girls tried to develop relationships with the sole male protagonist, which is especially evident in season 2 when some human-alien hybrid joined the club. Well, the operators of human-shaped spacecraft should got their downtime, and weaving such scenes between battlefields surely eased up tensions between life-or-death combats with aliens and contribute to better viewing experiences, and yes, our protagonist Nagate Tanikaze was the hero kid coming out of nowhere that everybody’s talking about, so it’s not strange for girls to surround him. But two seasons later, I still don’t know which girl Nagate Tanikaze is really into. On the surface, it looks like he very much enjoyed dating multiple girls at the same time, and down beneath, years of lives in secluded underground shelters made him look innocent before a sophisticated audience like us. The former is what I believed what most animation fan were into, the latter didn’t help build into the chivalry of a knight. Either way, I think too much of the series were devoted to relationships between Nagate Tanikaze and different girls, while at the same time, it has lost track of what it’s about, and what (should) make it great. The series should be about mankind’s battle against some alien species, not Nagate Tanikaze’s personal battle to save his girlfriends from extinction. It doesn’t take such a grand stage to do the latter. However, when Nagate Tanikaze is in his fighting gear, the series set a milestone in art of its own. Created by Polygon Pictures which is the pioneer in 3D modelling and CGI in the industry, the series created authentic models of the spacecraft with beautiful lightings, to say the least. And with the help of CGI, the fighting scenes were seamless, the particle effects and explosions were superb, but unlike Ajin which is created by the same studio, we were dealing with indeformable spacecraft rather than volatile IBM’s, so watching this series wouldn’t give you headache. Again, the typical under-saturated over-contrasted style from Polygon’s 3D CGI suited this series perfectly. Speaking of battles, there’s another part of Knights of Sidonia that I don’t like. Some people compared this series to Attack on Titan, in space. Well, throughout the two seasons of Attack on Titan, mankind’s equipment stayed the same, it’s the same vertical maneuvering equipment from episode one, except Alan’s friends gradually discovered that they could turn themselves into Titans one by one. On the Titan side, they didn’t evolve much, except a handful ultra-giant Titans popping up towards the end of the second season. This sort of equilibrium means the storyline of Attack on Titan was developing smoothly, something that audiences love. 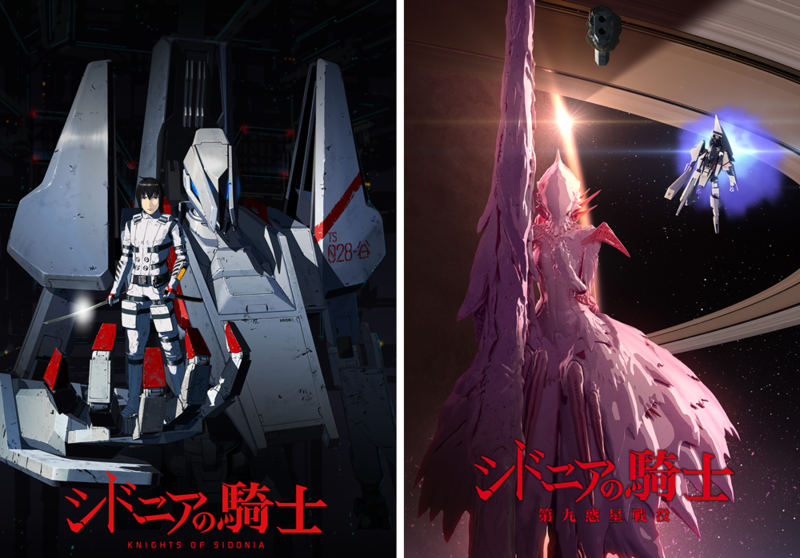 However, things are different in Knights of Sidonia, at the beginning of which the only effective weapon against alien species were some antique spears that mankind no long had the technology to produce, when a single alien creature nearly bought annihilation to an entire expedition team, if not for the protagonist on the team. Fast forward to season two, where we have missiles that could somehow kill aliens, when our protagonist was able to kill a million aliens on his own with relative ease. This speed of technology inflation over just 20 episodes was something I had never seen before, something a series anime like Knights of Sidonia shouldn’t have, and it’s thinly justified with mankind’s technology setback a hundred years ago. Combined with proportional quantity explosion on the alien side, the series look so unconvincing on the surface. There are many ways to magnify a protagonist, technology inflation is definitely not among the best. And finally, I liked Attack on Titan because the series hinted that somehow, mankind and Titans are connected through more than protagonist coincidence, something that’s bound to be revealed in later series. In Knights of Sidonia, it’s natural to suspect that mankind and Gauna (奇居子), the alien species invaded human have some underlying connections that are yet to be explored. The Gauna in season one came to mimic the shape of Shizuka Hoshijiro(星白 閑 ), the female Garde pilot absorbed by Gauna 490, in season two we even have a human/gauna hybrid called Tsumugi Shiraui. However, the series barely delved into possible connections between human and Gauna, except very occasionally the protagonists were dreaming about, what if human and Gauna could one day talk to each other, that’s it. Obviously, this is not a satisfying answer. So it wasn’t surprising to me that the series came to an abrupt end, where the protagonist came back to the underground shelter that he emerged from in episode one, while leaving many questions unanswered, like what drove mankind to such space exile in the first place, how’s the captain’s space settlement plan going and so on. The manga long ago ended, there wouldn’t be season three. Usually, technology inflation happened because the author doesn’t have a complete picture of the story in mind. “What to write for the next chapter? I have no idea.” “Let me just make the protagonist look cooler to attract audiences.” In such a setting, returning the protagonist to the underground shelter was the best an audience could reasonably expect. So apart from its beautiful battlefield anthems as OPs, which was reminiscent of a great SciFi series with grand setups and deep philosophical implications, by which I was spellbound, there’s little left in this series that I found of merit. Knight of Sidonia, A Sci-Fi Animation Series with Little except Good Music by Huang's Site is licensed under a Creative Commons Attribution-NonCommercial-ShareAlike 4.0 International License. ← Terror in Resonance, a Thought-Invoking Animation Series, for Japanese only?